Now that 2018 and the holiday season is but a fond memory, we now have time to look at doing some things in the yard. Besides the usual winter maintenance, January just happens to be a great time to plant bare root fruit trees. For those of you who are unfamiliar with the term “bare root”, it simply means the plants have been dug from the ground when they are dormant (without leaves) and the soil is gently washed from the root system. Typically for this application bare root fruit trees are what we call “deciduous” varieties. This means that the trees naturally drop their leaves in the winter time. Because these plants are in a dormant state it is easier for the grower to ship a large number of trees to different locations. The deciduous fruit trees are typically what we call “stone fruits”. This term describes fruits that have a pit or a single seed in the center. Peaches, Apricots, Plums, Cherries, Nectarines, and their hybrid relatives. We also carry a large variety of other fruiting trees that drop their leaves in the winter. Apples, Figs, Pomegranates, Persimmons, Mulberries, Jujube, Quince, Asian and low chill Pears. You are not limited to just bare root fruit trees, we also carry a diverse selection of deciduous berries. Blueberries, Raspberries, Blackberries, Boysenberries and Grapes. 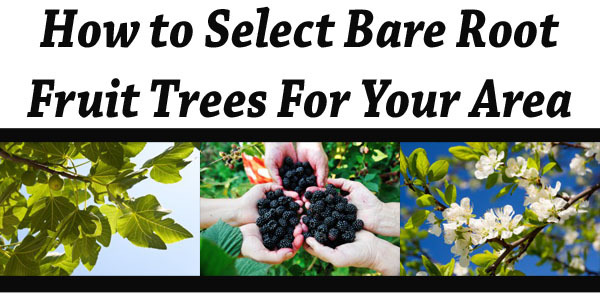 One reason we plant bare root fruit trees this time of year is there is a larger selection to choose from. Because Green Thumb Nursery Garden Centers have several locations throughout Southern California, each Green Thumb tailors their selections to the varieties that will be successful for their clientele and the immediate neighboring communities. Therefore each location will have different plant materials to choose from. Please feel free to contact the individual location for the different varieties they would have in stock. Now let’s look at how we actually sell the bare root fruit trees at the Green Thumb Nursery Garden Centers. We order the varieties for our area from a local grower called Dave Wilson Nursery. Just after the first part of January, we begin receiving our first shipments of fruit trees and berries. Because the plants are in a bare root form, the roots are immediately put in sawdust and kept moist until they can be planted. For ease of display and for customer transportation to their homes, we choose to individually containerize each tree before they are put out for sale. This makes it easier for the customer to see the individual trees in the display area and ensures that the roots will not dry out. If the customer is unable to plant right away they can simply leave the plant in the container and treat it as a potted specimen. Let’s talk about how to make some selections for your particular area. There are a few things you need to keep in mind, one of them being chill hours. Chill hours are the hours accumulated below 45° which cause the fruit trees to initiate their flowering cycle. For example, if a fruit tree requires 200 chill hours, that tree will need to be exposed to 200 accumulated hours below 45° before it will initiate a flowering cycle. If that amount of chill is not reached the tree will not flower, therefore it will not fruit. In the past when there have been warm winters many of our higher chill fruit trees did not produce fruit that year. If you are on the coast your chill accumulations are lower than someone in the mountains where they receive more cold. Also, you can stagger your fruit production by getting varieties with different chill hours, the lower the chill hours the sooner the fruit, the higher the chill hours the later the fruit. Before you make your selections be sure you know what your average chill hours are for your area. You can check with your “local” Green Thumb where they will have that information. The next item to consider is, does your tree or berry need a pollenizer? For varieties that are not self-fertile, they require a pollination partner, the partner has to be a different variety of the same fruit species. For example, if you plant a variety of plum that needs a pollenizer and you do not provide the partner plum, your fruit tree will flower, but it will not set fruit. The varieties selected for the pollination partners typically flower at the same time, therefore, ensuring an opportunity for cross-pollination. As long as the trees are located in the same general vicinity as an average size property or adjacent lot that should be close enough to ensure good fruit set. If you are limited for space you can actually plant 2 to 4 trees in the same hole. Just ask one of the Green Thumb Nursery professionals about “backyard orchard culture” and they will be able to explain to you how that works. Most of our trees come with tags that give you the chill hour requirements as well as the pollination requirements. If your tree does not need a pollinator, the label will read self-fertile. If your tree should need a pollination partner, the species that will best work for that particular tree will be listed. The only thing left now is to decide which of your favorite fruits you would like to grow for yourself, and where you can plant them. Just remember most fruit trees require at least five hours of direct sun and good draining soil. Check with your local Green Thumb Nursery professional on the proper planting procedures for fruit trees in your area as soil structure varies from one location to another. Happy planting and happy harvesting!